Home > Ham Holder or Ham-Support. What features should have a ham holder?Which Ham Holder should I buy?How to buy a ham online? What is a Ham Holder or Ham-Support? What features should have a ham holder? What types of Ham Holders can we find? What is a ham table? Which Ham Holder should I buy? How to buy a ham online? 1. What is a Ham Holder or Ham-Support? A Ham Holder is an instrument used to hold/place the ham in order to cut it easily. Whether it is a Iberian shoulder or a ham, a good ham holder or Ham-support is an essential part. There are many different model and designs with a lot of features that will be discussed below. It is very important to have a proper Ham Holder, since we are manipulating slicing knives, where a slip can cause totally avoidable scares. 2. What features should have a ham holder? First of all we need a secure and stable ham holder, as said before we are manipulating slicing knives and there is no room for error. Ham holders are designed to provide great stability, therefore we find tables with a considerable size and weight. The base of the ham holder is one of the key elements to obtain the needed stability, therefore this should be one of the most important features of a good ham holder. Secondly we should look for a practical ham holder, this means that it meets the purpose for which it was acquired, which is to hold the ham / shoulder easily and safely. On third place, it must look for an attractive and colorful design that pleases us. We may place the ham holder on a visible place like the kitchen or the dining room therefore it should have a nice design. Besides being attractive and colorful there are other very important aspects, for example having a adaptable ham holder, there are many designs/systems which allow us to adapt our ham holder to the size of our ham/shoulder, this features will be discussed below. Finally we must look for a quality ham holder at a reasonable price. Certainly to have a good ham holder is important, but definitely the most important thing is to purchase a good ham, either Iberian or Serrano. 3. What types of Ham Holders can we find? The purpose of this page is to list the different types of ham holders, giving the user the appropriate information in order to provide him with the knowledge to decide which ham holder is the most appropriated. 4.What is a ham table? 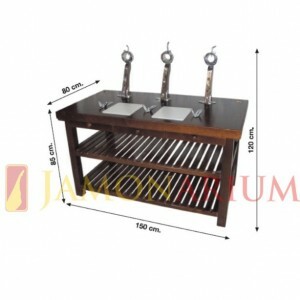 There are also Ham-Tables (Mesas jamoneras) for professionals and businesses, Ham-Tables usually have drawers and all the utensils to provide optimal conditions for cutting Ham. There are many different sizes, to cut one or more Hams/Shoulders simultaneously, they are usually made of top-quality pine wood and provide a elaborated image, ideal for ceremonies and banquets. 5. Which Ham Holder should I buy? First thing we need to understand is the importance of the ham holders basis its size and weight. The table of the ham holder is of vital importance, ham holders with relatively small tables might be more appropriate for cutting shoulders either Iberian or Serrano. Note that to cut ham it is worth to purchase a ham holder with a sufficiently large and heavy table(base of the ham holder), this will provide us the needed security to cut the ham easily and safely. system, those systems allow us to cut the ham in horizontal or vertical position, tailoring the ham holder to several measures. 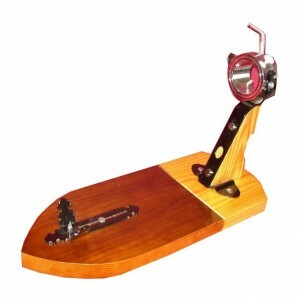 We always recommend adaptable Ham holders, if possible with extendable arm and V fastener with sliding system. 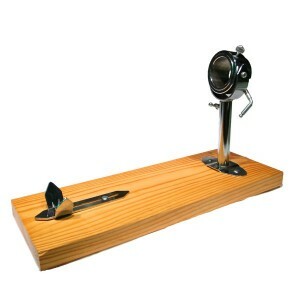 Secondly we have to decide the type of grip, we always recommend to purchase a ham holder with rotating gripping. This feature allows to turn the ham/shoulder without totally disengaging the ham from the ham holder, very practical. In third place we look for a ham with an attractive design, there are many nice and colorful designs most of them have a wooden base lacquered with non-toxic products. 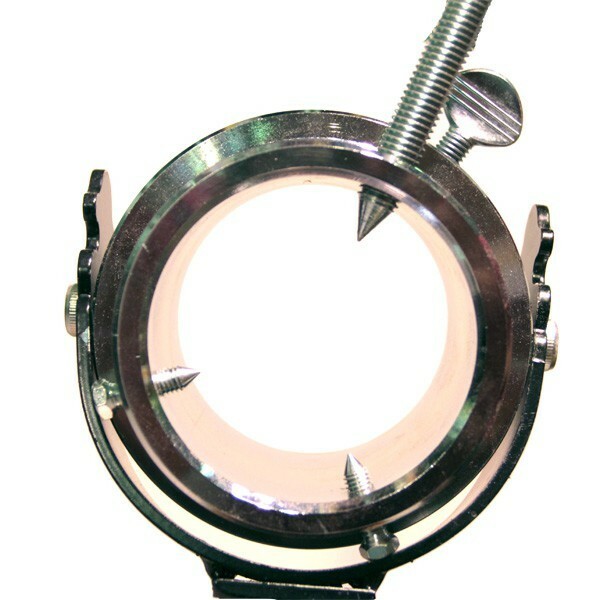 The ham holders have usually rectangular or acorn form with chromed metal fittings. And finally we must look for a quality ham holder at a reasonable price. Certainly to have a good ham holder is important, but definitely the most important thing is to purchase a good ham or shoulder, either Iberian or Serrano. 6. How to buy a ham online? Visit jamonarium.com, there you can find all kinds of ham holders, slicing knives and sharpeners, just take a look on the category accessories to find a wide range of products available. In Jamonaium.com it is always our goal to offer the quality products for a reasonable price, being of vital importance for us to ensure the high quality of all our products. Search the ham holder that suits you and place your order. You can also find very interesting packs “Cut Ham”.